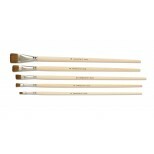 Flat red sable artist brushes made with the finest quality red sable hair. Polished seamless ferrules. Plain sanded wooden handles.